I am a TV addict. I have a tape somewhere of my second birthday. My parents came in to my bedroom toting a video camera. I think it was one of those over the shoulder numbers that used beta. So they wake me up in my crib with my fluffy red fro. I open my eyes, still filled with sleep, and they say “Happy Birthday.” I stare at them blankly. Cut to the living room. Camera is directed at the hallway. I come wandering out with my mom and head towards the front door. Then I turn and stop at the console television and say “TV! TV! TV!” motioning for them to turn it on. I sit down entirely too close and watch Maya The Bee. Even at the ripe age of two, it was obvious that I was a fan of television. That fandom has grown over the years. The majority of the shows I have found myself enjoying—well, still do—are dramas. I think it’s mostly because dramas are rich with both episodic plot and serial (season-long) plot. The characters are deeper than what you find in comedies. I am big on character. When I connect to a character, I’m hooked on the show. Example: ER. Lucy was my favorite character. I remembered her from one of my mom’s favorite shows Life Goes On. During season six, they decided her character wasn’t working and killed her off. I never watched another episode of the show again. You don’t kill off my characters. Counter example: The OC. I am a big fan of The OC (both the series and the California county). It was quite popular in film school. So popular in fact, I thought it was one of those trendy shows on HBO. As it turned out, it was on Fox so my new roommate and I caught up on the first half of the season at the beginning of the spring semester. I liked Ryan, Seth and Summer very much. Marissa was never my favorite character. At the end of season three, they killed off her character. That didn’t stop be from watching the show. I think my Grams has it right. Even as a child, I remember her calling the soap operas she enjoyed her “stories.” That’s what they are. They are stories, just like anything else. As a result, I rarely start watching a TV show after it’s been on the air a while. I want to start at the beginning. That’s a lot easier to do now, even midseason. The iTunes store and half seasons on DVD have made catching up pretty easy to do. I learned in film school how hard you have to work to get something on the screen. Every moment is intentional. You don’t start watching a movie halfway through, the same applies to a season of television. The thing I like most about TV is how long you have to build character and plot. Movies are just a snapshot of a story. I love movies, but they are different than TV. Bigger budgets often make them prettier, but a super amazing story is more and more rare these days. Now there are some elements that movies have going for them, don’t get me wrong. The music is usually better. The effects are always better and the acting is usually better. The story often suffers as a formulaic Hollywood plot. But if you get the right mix together, I’m wowed. Avatar is a great example. It’s a great cinematic feat. As a whole, I totally find movies entertaining, but they are easily forgotten. TV resonates more with me. I’m fully aware that’s not true for many people, maybe even most people. As my friend Jon put it once in high school, I’m “one weird duck”—which was fitting since my favorite hockey team has always been the Ducks (more on that in chapter four). As strange as it sounds, I have a pretty personal relationship with my television. It’s why I don’t have a roommate right now. When I come home, I want to watch my TV shows. I don’t want to share my TV with anyone. I have two DVRs for the nights when I have three shows that air simultaneously. 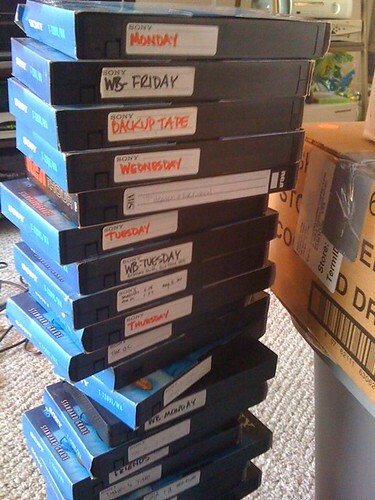 Before the advent of the TiVo, I used these for every day of the week. I don’t want to miss a minute in the lives of the fictional people that appear in my living room at my command on a big, enormous 42-inch screen. Did anyone catch the Little Shop reference there? I didn’t think so. Anywho, I’ll close with this. As Shawn once put it on Boy Meets World, “television is the true mirror of our lives.” At least, it feels that way to me sometimes. What ways to do you find yourself connecting to story in your day-to-day life? Read the next post in The Quest.